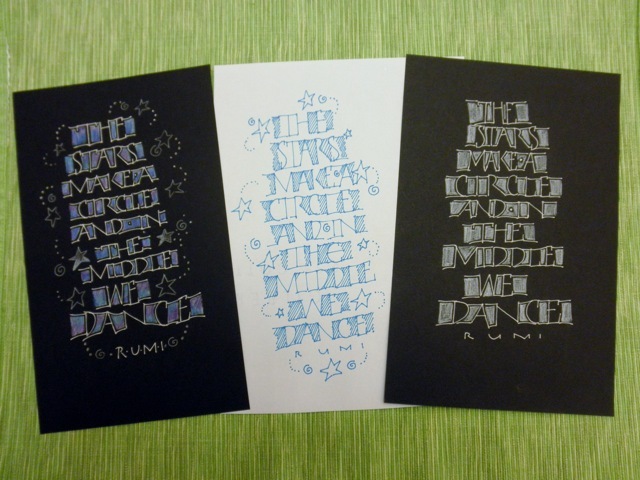 Well I decided that with all these cards perhaps you needed another style of monoline lettering ( those are letters written with a regular pen/pencil etc and that typically don’t have any thick and thin lines like you have in Formal Calligraphic Scripts.) My monoline alphabets were basically designed to be used to make cards, address envelopes ( non formal) and to use in scrapbooking. That said, I have seen monoline scripts mixed in with Formal Calligraphy for a very nice effect. In addition I would tell you that this one in particular is definitely what is known as a DISPLAY font /script. That means that it works best with just a few words, not probably with a long poem but even that might work depending on the layout you use and maybe also you might try not coloring in between all the letters . 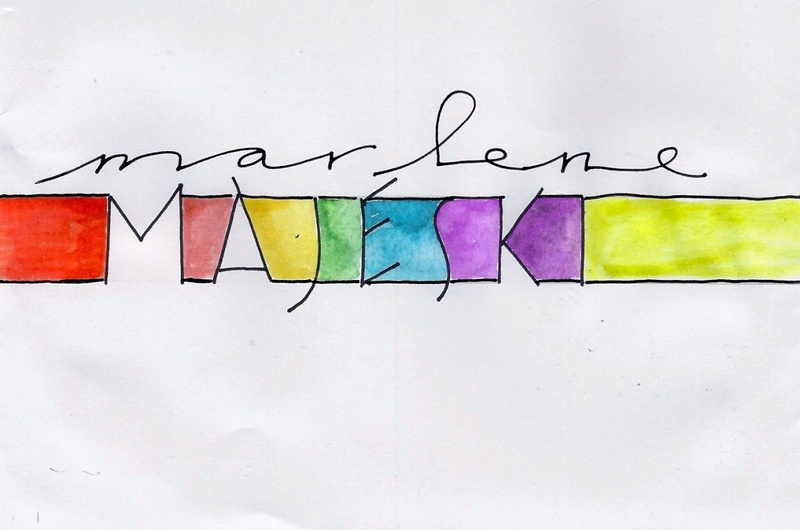 In addition, I personally don’t like to color in the counterspaces of the individual letters themselves but rather as shown on the title just between the letters. So don’t get carried away and try coloring in the bowls of the B, P, D, O etc…just between the letters. One last note as to color….I have always been told that 3 is the magic number, of course you could try for a rainbow effect or simply try shades of one color like Blue or Red etc..just each one a little lighter or darker depending on which you start with. Also while regular watercolors will work I love the tiny jars of sparkle watercolor called H20’S. These usually come in sets and each set is different so you don’t have to worry that you will get duplicates, however, you will find that some of the shades are so similar that it might seem that they are the same color. I think they are like TWINKIES and will last forever. I have had mine for several years and only a couple of them are even looking like I use them. I found them on line only at JO ANN’S FABRIC AND CRAFTS. I also found them at PAPER INK ARTS and again they are both selling them individually but slightly less then Jo Ann’s. The sets are often available at various stamp stores and even at some art supply stores. 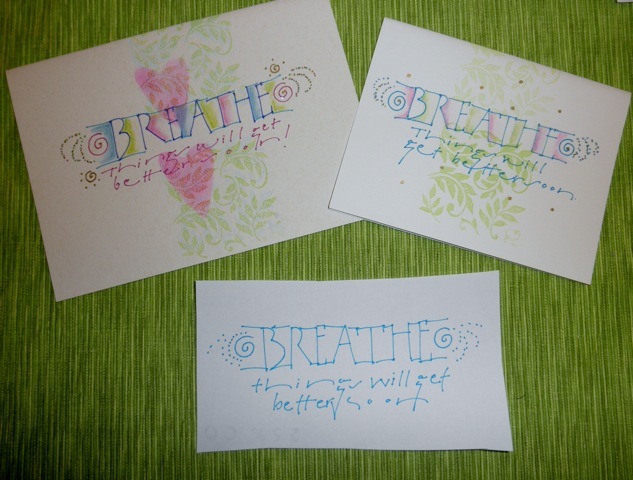 I have purchased them at STAMPING IN THE RAIN at the BOTHELL COUNTRY VILLAGE in Bothell. 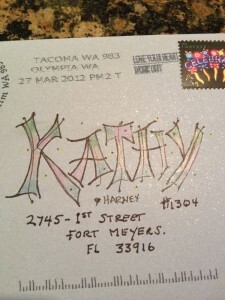 KIM (owner of Stamping in the Rain) used to have an online store but I just discovered that she isn’t doing that any longer , however, I am sure you can call her and find out if she is still carrying them. I also think that they sell them at IMPRESS RUBBER STAMPS but I couldn’t find them on their web site but that could be due to me not naming them correctly, so again if you’re in the Bothell , Tukwila area of Washington state you can either stop in or give them a call. I am also sure that if you just type in TWINKLING H2o’s at GOGGLE you will come up with quite a few different places where you can order them. 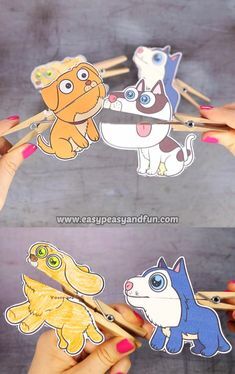 In any case, they are lots of fun and you can also use them to layer them over your writing or use them to color stamp images… You can also use them directly on the rubber stamp and then onto the paper to achieve a watercolor look to your images. Ok we have gotten way off track from the lettering so I want to share some other images of this style of lettering with you. 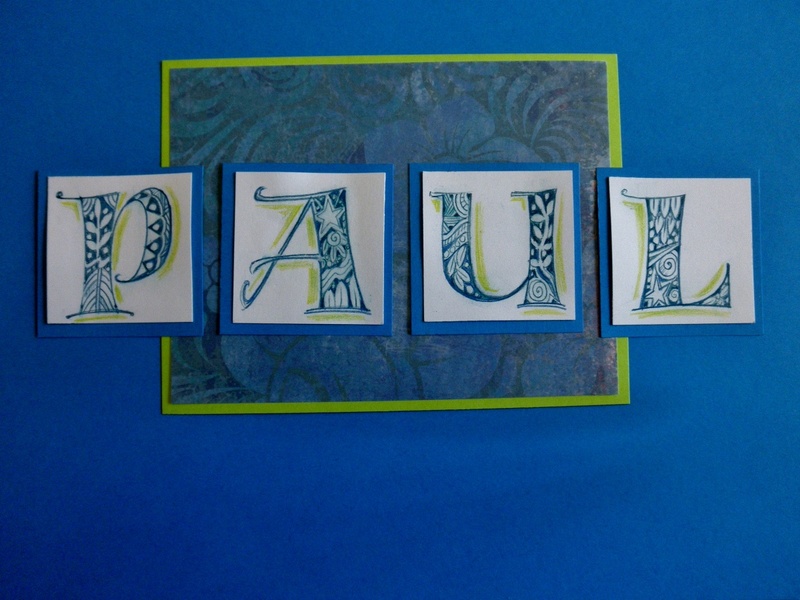 My good friend RANDI KANDER has played with these letters and taught some classes so I wanted to share some of her samples with you. 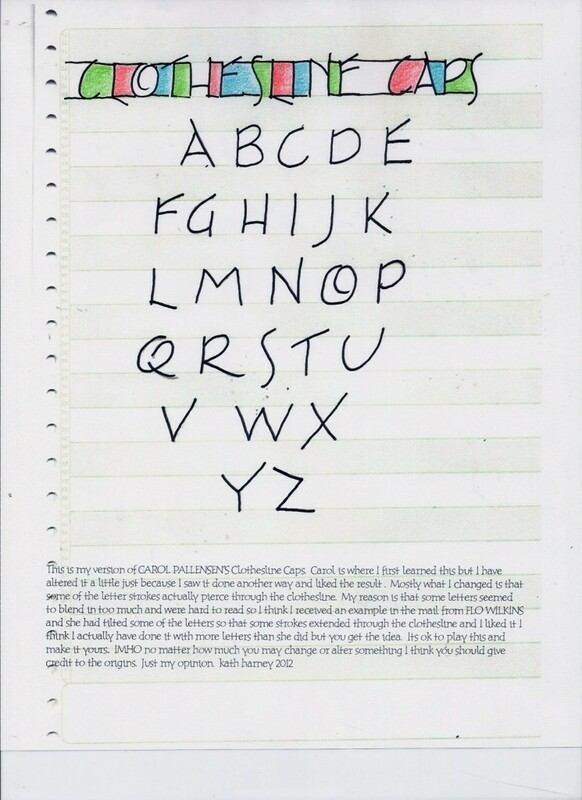 As you can see from these samples she did just use a few words and she make her letters look a little more like a “typewriter” style of letters. You’ll also notice that she mixed the “clothesline” with cursive Birthday and it makes a great effect. The samples here Randi shows you how she write the letters to begin with and then two different ways of dealing with the design . One of my favorite words of wisdom phrases is YOUR ONLY LIMITED BY YOUR IMAGINATION! And that is true as you can see. Sometimes you try something and it is not quite what you want but maybe you like it better or after doing it that way you think of another possibity. This is why we call it PLAY… AND YOU SHOULD GIVE YOURSELF PERMISSION TO DO IT AS OFTEN AS POSSIBLE… cause IMHO ( in my humble opinion) it’s GOOD FOR THE SOUL. I said Randi was a good friend and she never fails to amaze me….. I have never tried to do this on dark /black paper but Randi did and the results are spectular. You’ll also notice that she left off the actual clothesline and merely shadowed each of the letters . Randi you are definitely amazing. 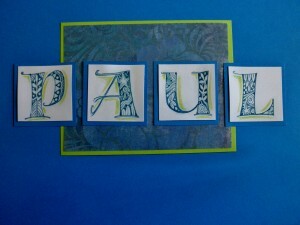 I also want to show one more image of Randi’s that it is actually based on the card I posted a few weeks ago, the WATERFALL CARD.. she wrote and sent me the pictures of her waterfall card… the first image is the one of her letters before she put them into the card. them to me and I’ll post them or not if you decide and think of it as your 15 minutes of fame. YOUR ON THE INTERNET…lol…Randi, thanks again for all your support and kind words and for sharing your talent. Now I have one more thing that Randi shared with me a few years ago. 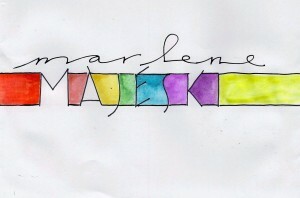 You may have guessed that she is also great at painting images and using watercolors. Well I have always wanted to watercolor even just backgrounds but I never seem to get it quite right so Randi showed me this technique of using masking tape to tape off a sheet of water color paper to create squares or rectangels then using a few of your favorite water colors paint the whole sheet and layer colors. A great time to use the Twinkling H2o’s . Let them dry on the page then gently remove the tape and VIOLA…..you have mini watercolor backgrounds that you can use to stamp on , write on etc. I am telling you she is a wiz and a terrific friend. So Thanks to you Randi, I think this is a great blog to learn to play with Clothesline Caps. Thanks also for being so generous and sharing your talent with me. 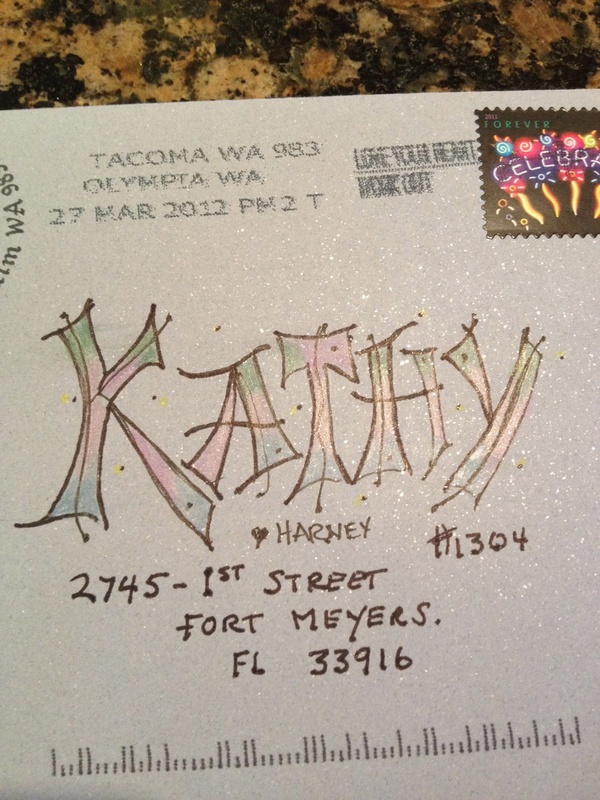 I added this envelope that I did for my friend and this was colored using the Twinkling H2o’s. I was attempting a rainbow effect but my orange looks more copper and my two purples are very close in color…always good to make a test of the colors first …so do as I say not as I did…lol.. The CUTTLEBUG machine is one of my favorite tools. It is almost always available at Michael’s or Jo Ann’s and that means you can use a coupon to purchase it, or its currently available at AMAZON for a very reasonable price. Basically its an dry embossing ( not using the powder and heat tool) and die cutting machine. 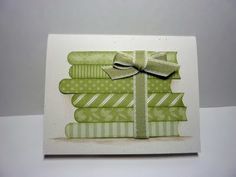 Its small and compact and there are bundle of TEMPLATES for the dry embossing as well as a die cutting machine. The templates are basically a folded piece of plastic with a variety of designs on them. 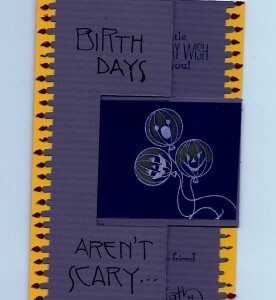 They produce a very deeply embossed image either positive or negative on your card stock or paper. 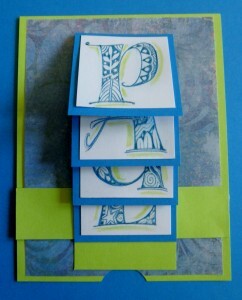 You can use either card stock or paper the paper works best if you are layering it onto card stock. 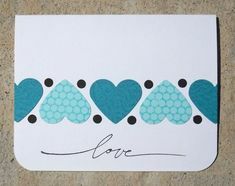 With the card stock if you have card stock that is colored on the outside and white on the inside or backside you can then also use very fine sanding paper to rub over the letters and scrub off some of the colored paper leaving the white showing for a distressed look. 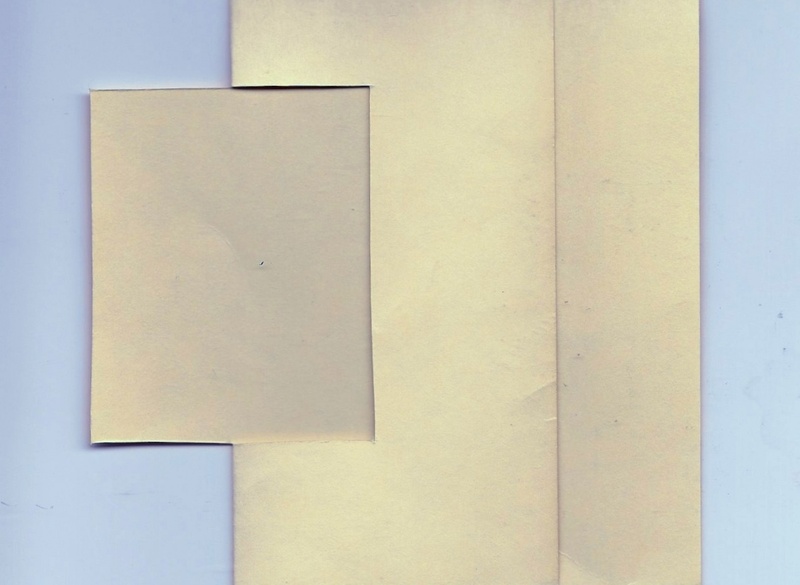 You can also use your pigment or die based inks to ink up the plastic template itself ,then layer your paper in between the fold and when you run it thru it will not only emboss the image but also add the ink color to the paper. Even using the WATERMARK INK PAD…which with stamps makes the paper you stamp it on a shade darker…you can also make the embossing just a shade darker with the template. Or AFTER you emboss the image, letters, design or number you can remove your card stock and gently rub over it with a stamp pad and color to it that way and depending on how hard you rub it will either give it a distressed look ( not covering all of the image) or totally cover the image. If you are looking for total coverage then I would recommend using the inking of the template first and then embossing. The various embossing templates can either create an image for on the front of your card or a background which you can layer another image or various stickers or ephemera on. 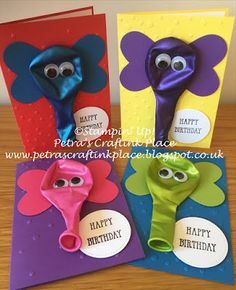 You can also use the cloth flowers or paper flowers that you might adhere to you card first then run it thru the with the embossing template and it will add that embossing texture to your paper or cloth images. Ok can you tell that I think this is a” hadda have” tool for your studio. It is also much easier on your hands and wrist than older metal templates that you would use a stylus to emboss and image or words. I have had my machine for several years and only recently started using it to cut the dies. Mostly because the Cuttlebug dies are somewhat childish. That said they do have several DISNEY images that are both an embossing template and a die cut, which means that you can cut out the image then lay it in the embossing template and emboss the details onto the die cut. For the dies, there is no end to the types of dies you can use with this machine. SIZZIX DIES can be used the thick ones that are usually by Sizzix or TIM HOLTZ as well as their smaller flatter ones called FRAMELITS. Framelits are basically multiple dies that cut concentric shapes in graduated sizes. In addition to FRAMELITS there are also NESTABILITIES that are pretty much the same type of images and sometimes these are easier to find. Usually they are all available at both Michael’s and Jo Ann’s. I think it will be up to you to just look on line as well as in those stores to see what images or shapes will appeal to you the most. Also Stampin Up sells quite a few of the FRAMELITS. Basically I have not found a single die that will not work in their machine. There are also some really cool LONG DIES that are from LIFESTYLE CRAFTS ( used to be Kwik-Cuts ) that will also work in the machine as you just need to run them thru with your short sandwiches and then slide the other half of the die into the sandwich and run it through also. You can also purchase other pads that are longer while it makes it go a little faster its fine to just use the short ones and run it thru twice. 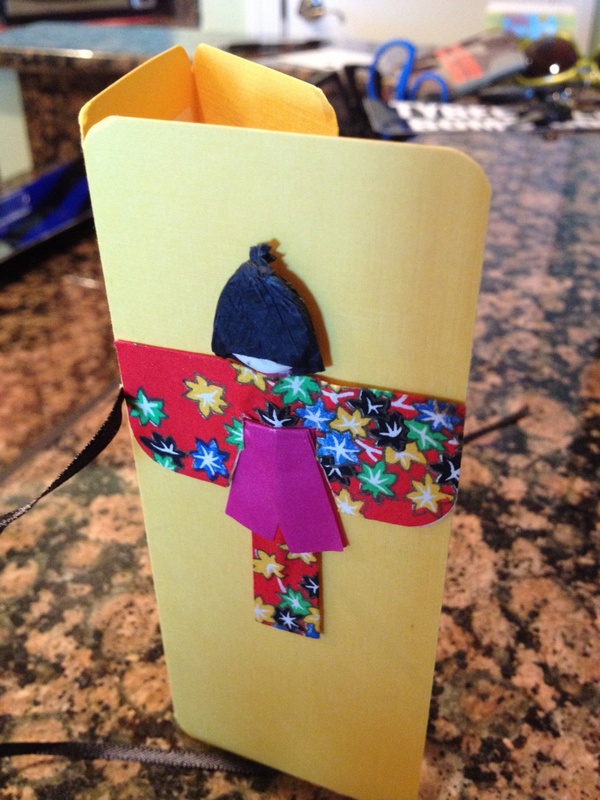 My favorite long ones are THANKS, LOVE, AND WISH,which will fold up and glue inside a card. ( those of you who know me know my love of Halloween so I recently bought a long one of a Spider web with a spider … but I plan to use it for birthdays too with the idea that BIRTHDAYS ARENT’ SCAREY..as long as they aren’t mine…lol. )THAT SAID… EACH ONE WILL PROBABLY NEED A DIFFERENT SANDWICH( that is what they call the layers of pads you use to cut the die) . It is important to get that sandwich right or it will probably break either the Pad or the template. BUT there is going to be some sound of crackling and or popping even with the correct sandwich but if it seems incredibly hard to crank it thru then STOP and check to see if you have the right sandwich. When I bought mine it came with an A pad, and 2 B pads as well as a C pad. Now however , it appears that it only comes with the A and the 2 B pads. But you can order a C pad which you will need for some other companies thin dies. Almost any die you buy will tell you how to layer it and which pads you need. For the big thick Sizzix dies you don’t need the A pad just the die and then a B pad for on top of the die. When you use the B pad with a die you are going to cut into the B pad and that’s ok…eventually you may have to replace that B pad but it will take a lot of cuts and you can flip it over and over again as it will also get a curve to it so when it does just flip it over and use the other side. I try to keep just one of the B pads for cutting so one will stay nice and crisp and clear then the other one will have the cut marks on it. OMG… I just received my order from the PAPER MILL STORE which I told you about in my previous blog. The papers are fantastic, especially one that I liked called Ruche cover 65 LB…it has this wonderful texture that is similar to crepe paper but that doesn’t do it justice. In any case they shipped fast and all the papers were terrific. I will definitely be ordering from them again. They also have different sizes and you can order larger quantities and share with someone near you. If you need papers I highly recommend you give them a try. 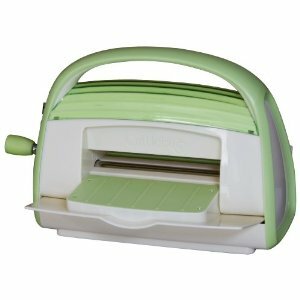 So this is my favorite embossing machine of those out there , there is at least one electric one but it is a lot more money. WEll that all for this week. Hope you find the information useful and as always feel free to send me comments or complaints or questions. AS ALWAYS THANKS FOR STOPPIN BY..hugs from you wire headed cyber toad ps remember Blue words take you to site. Red words just important tips. BEFORE we go to the card, I want to share something that you may not be aware of. Whenever you see the blue words on the blog that is direct link to the product or website and I try very hard to always set it up so it opens in a new page which means that after your done looking at product or website if you close it you will be back on the blog. Also the words in red are to let you know that I want to share something with you that I want to make sure you see. 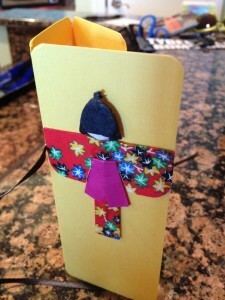 The SIDE STEP CARD is very similar to the Stair Step Card I gave you last week. This has a slight twist that I love since it gives me the chance to use a larger image on the left and still write and use smaller images on the right. 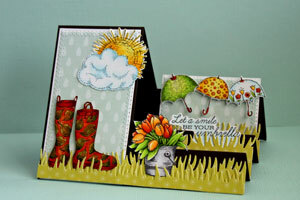 As you can see from this image they have used die cuts to create grass , bucket with flowers the middle image is grass with the sentiment and the back image is umbrellas and grass. Plus the added bonus is that this card will stand on its own…however, if you use this much add on’s then you will definitely need to use fairly heavy card stock. Since I am telling you about card stock here is a brief rundown of the way you know heavy from light. Actually you may have already figured it out. 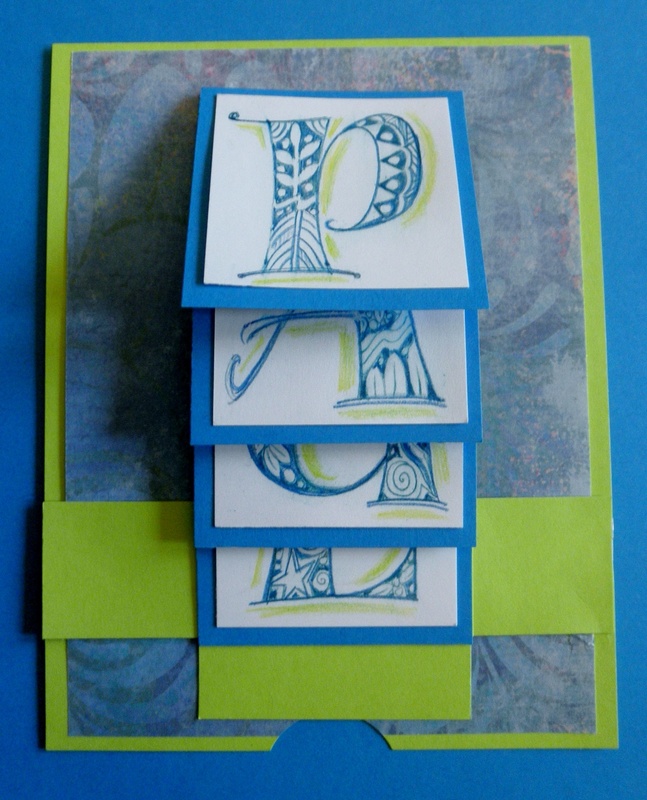 20# paper is considered TEXT WEIGHT…then there is 40# which is a rather light weight card stock fine for layering but not so good for standing on its own. 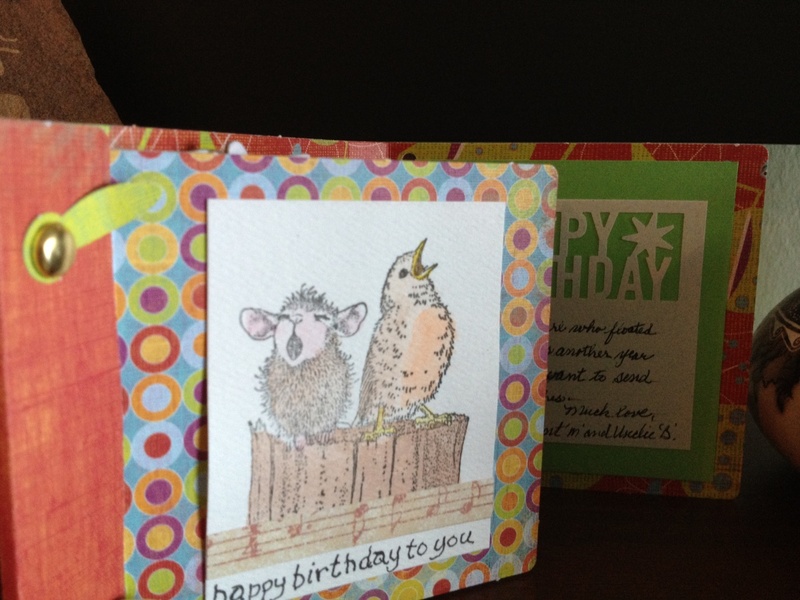 67# card stock is a good sturdy stock and will usually support a few layers . One of my all time favorites is 100# with out any texture it is usually listed as bristol and while heavy you will find that maybe a 67# with texture such as columns etc will feel and act heavier than the smooth 100# Right now there are not any really good places to get card stock other than what you find in stores such as Michael’s and Jo Ann’s Craft. The Office supply stores such as Office Depot, Office Max and Staples each carry a light or medium weight card stock and there is not a lot of choice in color ..usually a pastel. 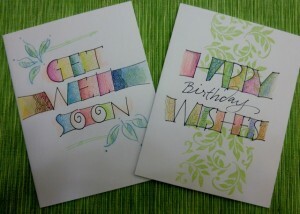 I haven’t found a good source of card stock now that Paper Zone has closed its door. OK I stand corrected sometimes its just dumb luck.. I went to see if I could find any paper source and the first one I came to was PAPER MILL STORE and amazingly I was going to tell you that buying by the ream was the cheapest way to get papers and that you can get together with a few friends and share a ream (BTW a ream in card stock is only 250 sheets not the 500 in text weight) BUT this PAPER MILL STORE has it in packages of 25 sheets and that will allow you to cut each sheet in half either vertical or horizontal and yield you 50 cards. There are all types of papers and colors… I know I will place an order with them soon and I am fairly sure they have envelopes too however again your cheapest envelopes are going to come in white or off white at one of the office supply stores. I did find that when I placed my order because I have a different billing and shipping address they will will want you to call them and verify the billing address and shipping address. I wanted to let you know that this is also a perfect card for pre cutting and pre scoring and storing in the with the directions inside the sheet protector.. I have several cut and scored in various colors of paper so that when I need a quick card I can grab one and simply decorate it. 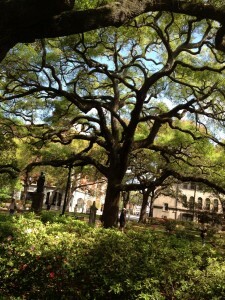 THE FOLLOWING PHOTOS are from my Birthday Celebration in Savannah. This first one is a photo of the amazing trees in the various parks. 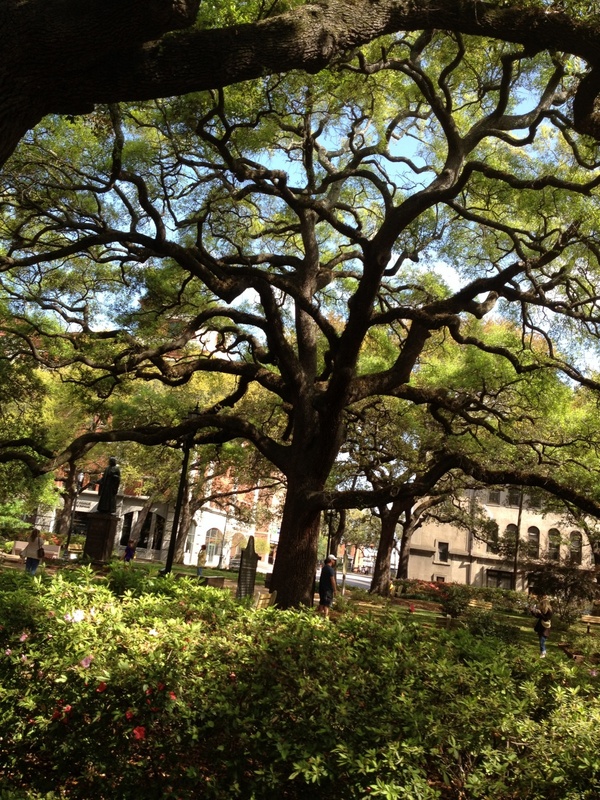 Savannah is filled with lovely parks like this each filled with all these lovely LIVE OAK trees and lots of benches where you can sit and look at the trees or just rest in the shade. 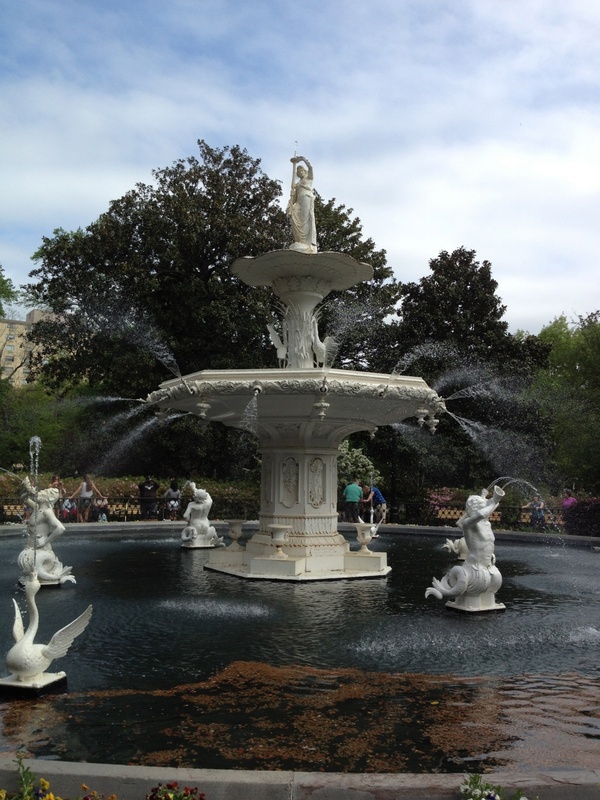 This next one is a photo of the fountain in Forsyth Park. It was very lovely and again had lots of lovely benches so you can sit and look at the fountain and listen to the lovely sounds. We could see this fountain from our room as well as from the outside veranda on the hotel. 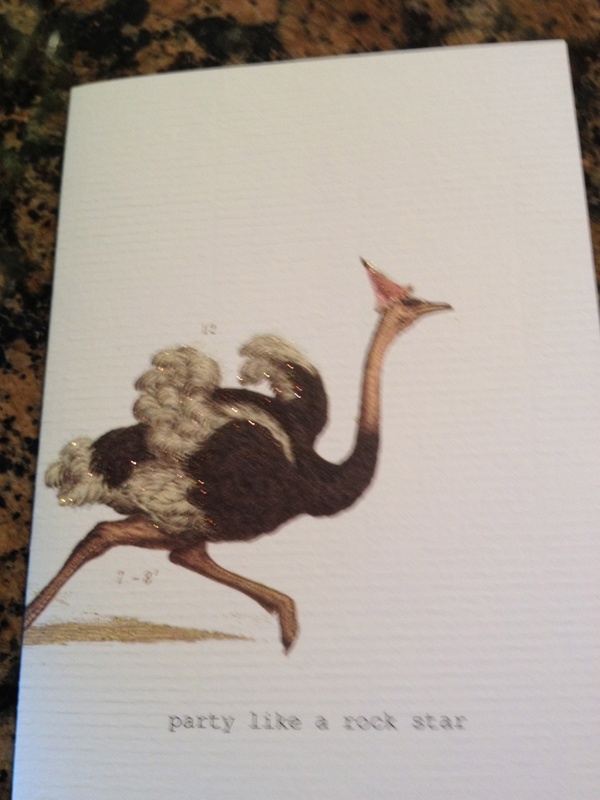 This a one of the wonderful cards my good friend CHRIS SABO sent. 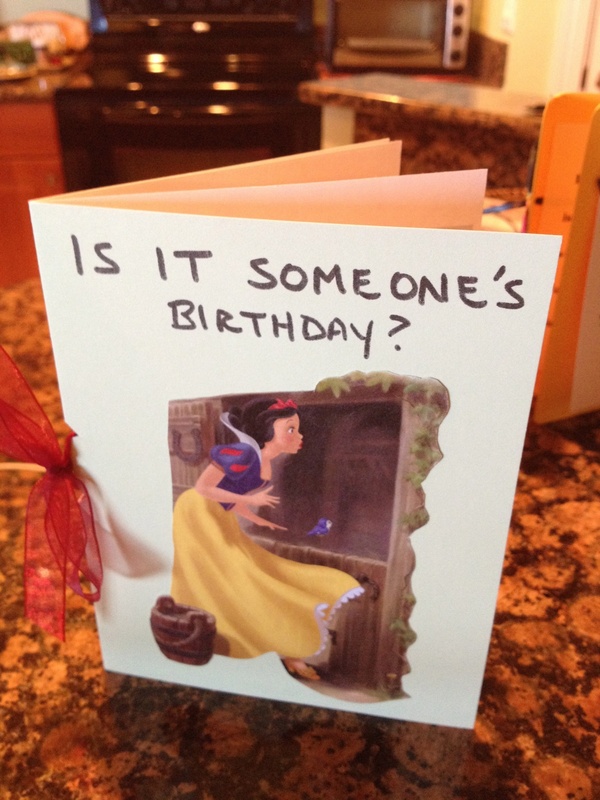 Every year Chris surprises me with an unusual and delightful card. 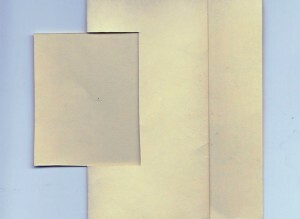 This is an envelope that Bonnie Noehr sent me with my Birthday card and the envelope was simply lovely with terrific Italic lettering with lovely gold dots. 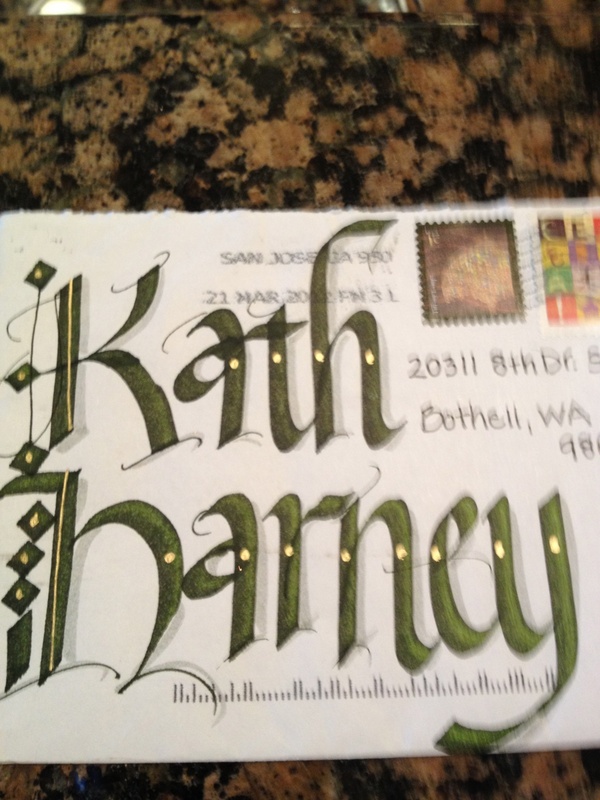 This envelope was from my good friend Carole Crose and it was lovely also . 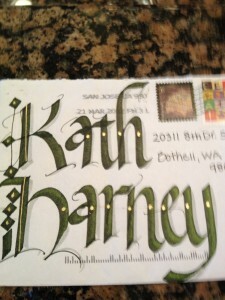 Each of the letters was filled in with a lovely shiny ink. from a dear friend Jennifer Szumanlanski. 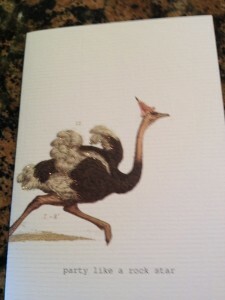 It was so cute with glitter on the Ostrich. 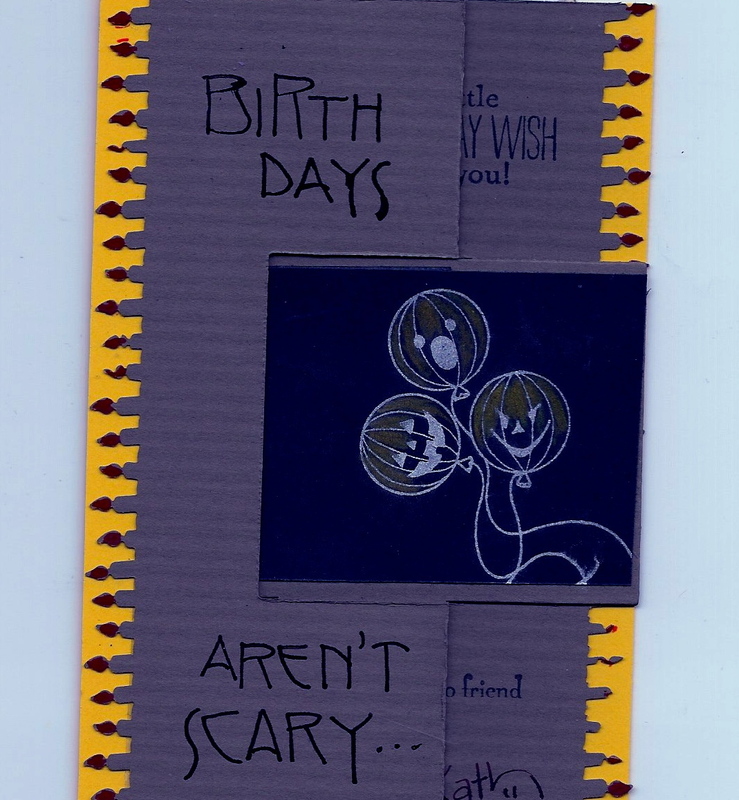 This is a wonderful booklet made by my Auntie M. It is a lovely card with multiple pages and the back page has the punch that said HAPPY BIRTHDAY. I think this was a kit but it was filled with her lovely images .